SMART goals are designed to foster a clear and mutual understanding between an employee and manager of what it takes to excel in a job. The SMART method acronym stands for: Specific, Measurable, Attainable, Relevant and Time-bound. 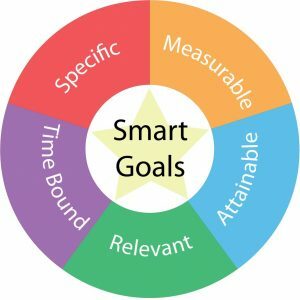 The SMART goal method differentiates performance from development, creating goals for each. SMART goals accompany an action plan that provides a roadmap for a supervisor to monitor achievement and an employee to provide feedback. Creating a SMART goals roadmap helps narrow the focus of what the employee plans to achieve. Goals should apply to the position and relate directly to the employee’s career path and personal abilities. Direct relevance ensures engagement and the employee’s likelihood of accomplishing the specified objectives. SMART goals also offer an employee purpose. Understanding their place in the vision and big picture not only helps keep an employee on track but also motivates him/her toward a collaborative effort for organizational success. Begin a SMART program by surveying an employee’s accomplishments. List strengths as well as weaknesses. Further, identify specific tasks in which the employee performed well as well as those areas which need improvement. Creating an action plan does not mean relisting the goals established previously, but drawing on a more in-depth, proactive scope to give meaning to the roadmap. Note that performance goals apply to job responsibilities while development goals pertain to learning and advancement. Do not be reluctant to encourage the employee to try something new, particularly if the task moves the employee forward in career or learning. Many employees are eager to learn and grow in abilities and job responsibilities. Statistics show when employees have more buy-in to their jobs, there is less job turnover and more satisfaction. Employees are much less stressed, less complaintive and more collaborative. Moreover, when they are motivated, the company as a whole prospers.